Revisiting the history of The Town Hall means exploring some of the most important social and musical events in New York City over the past century. And with the debut of The Town Hall Ensemble performing City Suite on October 22nd, audience members will share in some of the great moments and movements that occurred on this iconic stage. 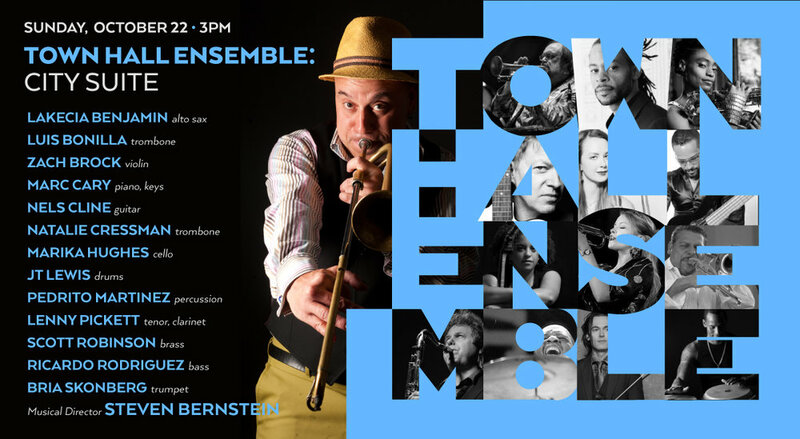 A newly-formed and rotating all-star collective directed by trumpeter, arranger and bandleader Steven Bernstein and featuring some of the best musicians in New York City, The Town Hall Ensemble will perform a concert suite celebrating social justice movements and historic music performances at the Town Hall. This benefit concert will support the Town Hall Foundation and the Town Hall Arts in Education program, including the new Town Hall Ensemble music outreach initiative, gearing up for the venue’s 100th anniversary in 2021.